Cinque Terre is without a doubt one of the most beautiful places I’ve seen in the world and it comes as no surprise that it’s also a UNESCO World Heritage Site. Italy is well-known for its breathtaking cultural and natural locations and Cinque Terre is yet another perfect place in this country, designed by nature. If you look for picturesque panoramas, lovely beaches, delicious food and friendly locals then this place is definitely a must-see! by plane – if you are coming by plane there are few options you can consider. 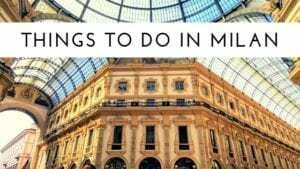 The nearest airport is the Pisa International Airport but you can also fly to Milan or to Genova and reach Cinque Terre from there quite easily as well. by train – depending on your location you can take a train to La Spezia where you change and catch another local train to one of the five villages. by car – if you are coming by car it’s best to leave it at a parking lot in La Spezia and continue the trip by train. 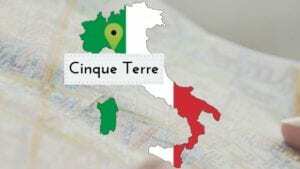 It will take around two hours from Milan and Florence to reach Cinque Terre by car. Cinque Terre includes five villages: Monterosso al Mare, Vernazza, Corniglia, Manarola, and Riomaggiore – all of which beautifully situated along the coastline in the Liguria region. I started discovering Cinque Terre from the sweetest town of Riomaggiore. Riomaggiore welcomes you with its colorful houses situated on the rocks, romantic narrow streets, and a unique atmosphere. It’s easy to fall in love with this charming village that dates back to the 8th century and kind of makes you feel as if you’ve taken a stroll back in time. Also, Riomaggiore is where the famous Via dell’Amore (path of love) starts – a trail excavated in the rocks that leads to Manarola. When it comes to monuments and places of interest you will mostly find beautiful ancient churches with an impressive history. In fact, there is the San Lorenzo Church which dates back to 1338, San Giovanni Battista Church from 1340, Oratory of Santa Maria Assunta in the historical center of Riomaggiore and many other interesting spots you can discover if time isn’t an issue. The next village in the Cinque Terre itinerary is Manarola. Out of the five villages, Manarola is probably my favorite one and even though it’s a small town I spent most of my time there. Made up of colorful houses laying at the top of the cliff this is truly a postcard-like location and a dreamy destination for all the photographers. Of course, you can’t miss the San Lorenzo Church which dates back to 1338 and comes in a Romanesque style. There is also the castle, once a defensive bulwark against the attacks of the pirates it has been transformed into a private residence over the centuries but you can still have a chance to see it from the outside. To get to Corniglia – the smallest of the five villages you will have to climb the Lardarina – the very long and demanding brick staircase of 382 steps. The good news is that what’s waiting for you it’s totally worth the pain. The village of Corniglia develops around the main street, Via Fieschi, which leads from the parish of San Pietro to the belvedere of the terrace of Santa Maria. In the square of the church, it is still possible to find some remains of the medieval architecture, including some small sculptures. At the main square of Corniglia – Largo Taragio, you will see the Monumento ai Caduti and Oratory of Santa Caterina. Behind the small church, there is a long and steep staircase that will take you to top of the 16th century Tower. From here you can admire a breathtaking panorama of the sea and of the coast. Vernazza was the fourth town I visited and it turned out to be as charming and beautiful as the three villages before. The town is full of colorful houses and adorable alleys and I didn’t mind getting a little bit lost in there. There is also a cute small beach so make sure to bring your swimming costume or at least dip your toes in the warm Mediterranean sea. Places of interest in Vernazza include Church of Santa Margherita d’Antiochia, Doaria Castle and Chapel of Santa Marta. My trip to Cinque Terre ended in Monterosso – the most populous town among the five towns. Apart from some beautiful churches and ancient statues, the best part of Monterosso is its fantastic long sandy beach with crystal clear water. Especially If you are visiting in the summer months you have to take advantage of the warm sea and hot Italian sun. Cinque Terre in Italy is a popular location and I think it’s best to book your hotel in advance in order to make your stay as pleasant and relaxing as possible. Locanda a Cà Du Gigante – located in Monterosso al Mare, very near to the beach. Estate Riomaggiore – this a perfect option for those of you who prefer apartments over hotels and resorts. They are well-equipped and ideal for families. Camere Nicolina – cozy rooms with everything you need, located in Vernazza. So very beautiful. I’m adding this to my bucket list.